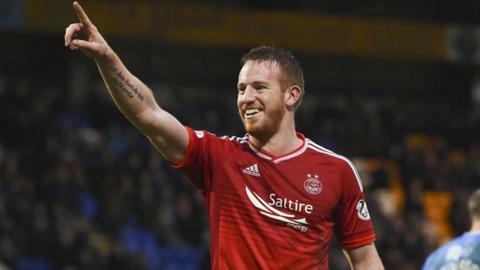 Aberdeen manager Derek McInnes has revealed that top scorer Adam Rooney is facing six weeks on the sidelines. The Irish striker has scored 19 goals for the Dons this season and has been an ever present in the side. "Adam took a slight strain on his thigh doing some shooting after training on Thursday," McInnes told BBC Scotland. "It's developed into something a wee bit more. He's going to be for a good few weeks. You would have to suggest it will be in the region of six weeks." Rooney had been due to make his 100th appearances for Aberdeen against St Johnstone on Saturday. The Dons also have injuries to Jonny Hayes and Craig Storie, though McInnes said Storie - who signed a new deal with Aberdeen during the week - will be back training on Monday. "It's a shame for him (Rooney). He was so excited about playing his 100th game," said the Pittodrie manager. "Some of my comments prior to the game was that he's never injured. To pick up almost 100 appearances in just under two years is quite remarkable. "We all know the importance of his goals. It's up to others to step up and that's exactly what a squad is all about." He added: "You have to overcome these things. You can't let it beat you up and use it as an excuse. We still feel we've a good attacking threat in the team."